You will earn 12,664 Reward Points. Earn 1 reward point for every 1 dollar spent. Traulsen's already durable, energy efficient R-Series reach-in-pass-thru and roll-in/roll-thru models are available already built with all the features needed for use in a corrections environment. These reliable models are optimized for the demanding needs of all security levels, and each is built with microprocessor controls, communications ability and stainless steel cabinet interior/exterior construction. The correctional package is designed to protect the cabinet from unwanted damage/vandalism, removal of contents or components, as well as from being pushed over (see details below). Three section, as well as models with half-height doors and other hingings are also available upon request. Cabinet exterior, interior, louver assembly and doors are constructed of stainless steel. The exterior cabinet top, back and bottom are constructed of heavy gauge aluminized steel. On roll-in/roll-thru models the interior floor and exterior bottom are constructed of stainless steel and insulated with 3 ⁄4" of resilient cork (a readily attachable stainless steel ramp is also provided). A set of four (4) adjustable 6" high stainless steel flanged legs are included to provide for secure mounting to the floor (reach-in/pass-thru models only). Doors are provided with locking hasps and equipped with a gasket protecting metal door pan (reach-in/pass-thru models only), removable plug cylinder locks and guaranteed for life cam-lift, gravity action, self-closing metal, glide hinges with stay open feature at 120 degrees. Hinges include a concealed switch to automatically activate the interior incandescent lighting. Guaranteed for life, work flow door handles are mounted horizontally over recess in door which limits protrusion from door face into aisleways. Safety screws are used throughout the cabinet in order to prevent removal with anything but a very specialized tool. Easily removable for cleaning, vinyl magnetic door gaskets assure tight door seal. Anti condensate heaters are located behind each door opening (refrigerator & freezer models only). Both the cabinet and door(s) are insulated with an average of 2" thick high density, non-CFC, foamed in place polyurethane. The easy to use water resistant INTELA-TRAUL® microprocessor control system is supplied standard. Unit is NAFEM Data Protocol communication (NDP) ready. Optional hardware required to be NDP compliant. Third party software required for network connection. It includes a 3-Digit LED Display, Fahrenheit or Celsius Temperature Scale Display Capability, and an RS485 data port. In addition it includes, where applicacable, audio/visual alarms for: Hi/Lo Cabinet Temperature, Door Open, Clean Condenser, Evaporator Coil and Discharge Line Sensor Failures, and Power Supply Interruption. Hot food holding cabinet models also include an ON/OFF button. The control is protected behind a high-impact resistant lexan cover. A top mounted, self-contained, balanced refrigeration system using either R-134a (refrigerators) or R-404A (freezers) refrigerant is conveniently located behind the one piece louver assembly, and protected behind a heavy gauge stainless steel mesh screen. It features an easy to clean front facing condenser, thermostatic expansion valve, air-cooled hermetic compressor, plenum effect blower coil, large, high humidity evaporator coil located outside the food zone and a top mounted non-electric condensate evaporator. Biased return air duct protects against introduction of warm kitchen air, promoting even temperature maintenance and efficient operation. A 9' cord and plug is provided. 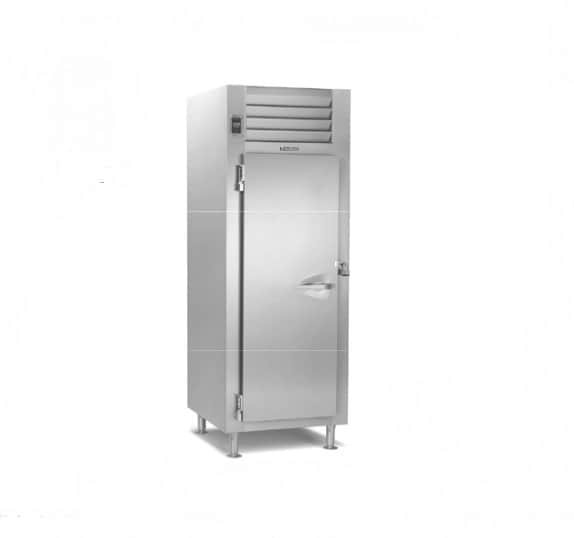 Standard operating temperature is 34 to 38°F for refrigerators and 0 to -5°F for freezers. A low watt density, serpentine style, heater is employed for the generation of electric heat. Low velocity air is forced across its large surface area to efficiently move heat radiating away from these through a down-air distribution duct, where it is then evenly distributed throughout the cabinet, assuring the proper holding environment for hot food product, without drying. A vent, located at the top of the cabinet, is included for positive humidity control. Standard interior arrangements include 12 pairs of universal tray slides per section, welded to a steel frame in order to prevent removal. Readily removable, interior-mounted, stainless steel guides for rack are provided for protection. Maximum rack size with wheels inboard of frame is 27" wide by 29" deep by 66" high. Racks supplied by others. Both a three year parts and labor warranty and a five year compressor warranty (refrigerator & freezer models only) are provided standard.